The Productivity 1000 series of programmable logic controllers has a slim stackable super compact design. This is sometimes also referred to as a shoebox PLC because of the shape and way in which expansion modules are added. 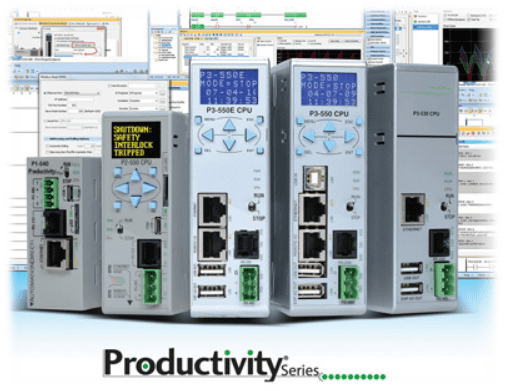 This new Productivity 1000 series PLC is the latest in the Productivity series of controllers that have hit the market. These three series currently make up the Productivity Series form Automation Direct. The Productivity 1000 series PLC provides the following features for your automation control panel. – 50MB user memory – Can handle very complex applications easily. 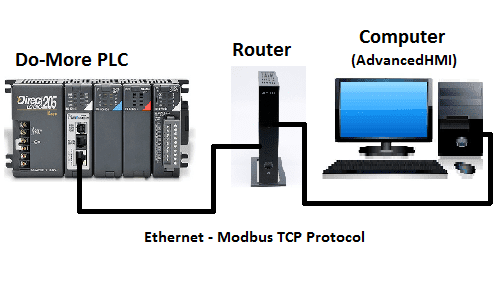 – 4 built-in communication ports – Easy connectivity to your network. 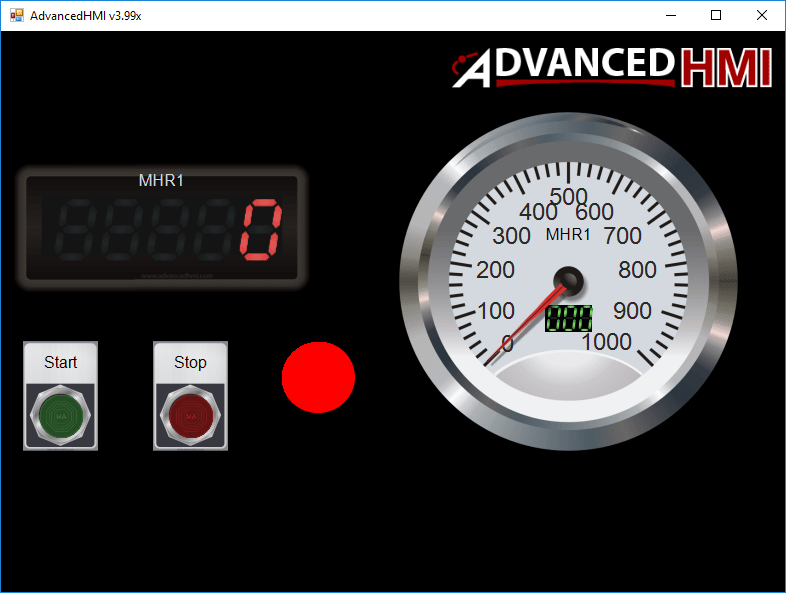 This would include your PC, HMI, Networks, etc. – Add up to 8 IP modules to communicate to your field sensors. This will give you a total of 128 discrete IO points or 32 analog IO channels. – Free Software and 30 days of free training with every CPU from Automation Direct. – Auto discovery IO – Physical I/O tags will be generated based on each module’s position in the base. You can also reconfigure the setup and assign new tags manually. – I/O Modules have QR codes under the wiring cover. This can be scanned so you can have the latest specifications / wiring diagrams for the module. We will be looking at allot of these features of this powerful controller. Let’s start by looking at the hardware. Continue Reading! One of the features of the BRX Series PLC is the ability to expand its capability to fit your application. This is easily done by “snap-on” modules that will fit on the side of the BRX MPU (Multi Processor Unit). As we have seen before in the BRX PLC System Configuration post we can add additional discrete inputs and outputs. Automation Direct now offers Analog Voltage and Analog Current input and output modules. These modules come as an 8 point channel unit. There is also a 4 point thermocouple input module also available. We will be configuring, scaling and programming the Analog input and output Voltage modules for our BRX PLC. Let’s get started. Continue Reading! Sending email messages from the PLC sounds like an easy task. However, very few applications do this on the production floor. This is probably due to the networks involved and user authentication can be complicated. In our example, we will use a restricted Gmail SMTP server so no authentication will be required. We will walk through sending email and text messages from the PLC to Google Gmail. Once in your Gmail account, the message can be automatically forwarded to another verified email or SMS text message address. The BRX Series PLC also has this Email capability along with attaching files. We will also be looking at secure email services with the BRX Series PLC. Let’s get started. Continue Reading! Data logging does not have to be complicated anymore. The BRX Series PLC can log your specific data up to 32 Gigabits on a Micro SD Card. It will store your data for future data analysis in a CSV (Comma Separated Value) Txt file based on time and/or event. This is all accomplished with just one instruction in the BRX PLC. Excel is just one program that you can import and analysis this CSV Text file. Do-More Designer has a Browse PLC File Systems window that will allow you to copy, create and delete the files from the connected computer. This will save you from going to each controller, removing and copying the files on the Micro SD Card. We will be looking at the data logging instruction in the BRX Series PLC and how to retrieve and view this information. Let’s get started. Continue Reading!